Dan Moutal is the co-founder of Planet3.0, a photographer, and blogger trying to find solutions to the most complex and pressing problems we have ever faced. Between November 9–11, 2013, a large iceberg finally separated from the calving front of Antarctica’s Pine Island Glacier. Scientists first detected a rift in the glacier in October 2011 during flights for NASA’s Operation IceBridge.By July 2013, infrared and radar images indicated that the crack had cut completely across the ice shelf to the southwestern edge. New images now show that Iceberg B-31 is finally moving away from the coast, with open water between the iceberg and the edge of Pine Island Glacier. The Operational Land Imager on the Landsat 8 satellite acquired these natural-color images of the iceberg in Pine Island Bay on November 13 (top) and October 28, 2013. Clouds and fog make the November 13 image a bit hazy, but the open-water gap between the iceberg and the ice shelf is still apparent. Click here for a wider view of the iceberg from November 10, just after the separation. Named B-31 by the U.S. National Ice Center, the new iceberg is estimated to be 35 kilometers by 20 kilometers (21 by 12 miles), roughly the size of Singapore. A team of scientists from Sheffield and Southampton universities will track the 700 square-kilometer chunk of ice and try to predict its path using satellite data. The shelf of Pine Island Glacier has been moving forward at roughly 4 kilometers per year, so the calving of this iceberg is not necessarily a surprise, noted Tom Wagner, NASA’s cryosphere program manager. Such events happen about every five or six years, though Iceberg B-31 is about 50 percent larger than previous ones in this area. Scientists have been studying Pine Island Glacier closely because there is evidence that warmer seawater below the shelf will cause the ice grounding line to retreat and the glacier to thin and speed up. If Pine Island Bay clears of ice by the annual sea ice minimum in February–March, then Iceberg B-31 could move out into the Southern Ocean. 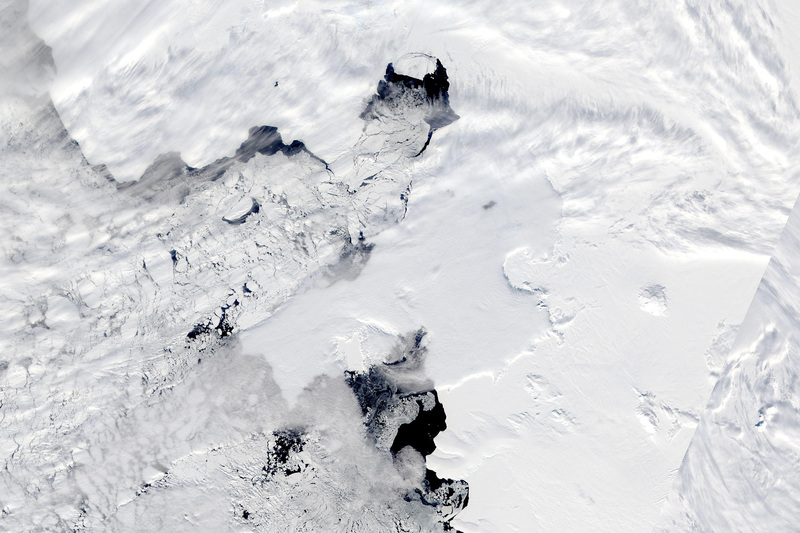 (Click here for a wider view of Antarctica and the sea ice blocking the path.) Once it leaves the bay, the iceberg is likely to get caught up in the flow of the “coastal counter current”—which flows counterclockwise around Antarctica—or the “circumpolar current,” which is larger, wider, and flows clockwise. Which way it goes depends on the vertical shape and depth of the iceberg, according to NASA scientist emeritusRobert Bindschadler. “Where it is going depends on the deeper currents into which its keel extends,” he said. Researchers have found that larger icebergs with deeper keels tend to drift with the deeper, cyclonic circumpolar current, while sea ice and smaller bergs with shallower keels tend to drift with the coastal counter current. NASA Earth Observatory images by Holli Riebeek, using Landsat 8 data from the USGS Earth Explorer. Caption by Michael Carlowicz. This article was posted in Featured Image. Trying once more with the inefficient scientific part of my brain to avoid overconcluding from the visual (not to mention short-term), I see the date on this link is easily changed, so plan to have a good stare at a few years and see if there appears to be a trend, remembering that this year there is more ice to melt, and that means it's the sum not the detail that matters. I think I should abandon my ignorance and see if I can figure out how to animate them. Deniers are claiming a big chunk of Antarctica breaks off every few years (surprise).